I feel like I might end up in Vietnam at my next school! No they don’t speak Spanish in Vietnam. No I most likely wont be able to save as much money as I currently do in Vietnam. Nor have I even applied to any schools in Vietnam! However, it seems like every time I open my news feed I see something about how awesome Vietnam is. Or on Facebook one of my fellow international educator friends is posting about her weeks long backpacking trip through Vietnam. Or my friend at work tells another story about her fabulous life living in Ho Chi Minh City (more commonly known as Saigon). I just feel like the Universe is trying to convince me to give Vietnam a shot. According to their website, “SSIS is owned by the Phu My Hung Corporation but operates as a non-profit entity within the company.” Kinda tricky, but it sounds like it is basically non-profit, US accredited, offering an IB diploma. On the school website it says there are, “870 students from over thirty-five countries.” The school says that there is a 20% cap to provide a true mix of nationalities. Their website breaks it down, “…19 % of our student body are US citizens, 19% are Korean and 16% are Vietnamese.” It sounds like a good mix to me! Their website also says the student to staff ratio is 10:1! My favorite part is that there is an English speaking certified Vietnamese TA for each elementary classroom. After having had a TA for 3 of the 5 years that I’ve taught overseas, I just think this is the ideal situation for any elementary classroom- especially one with a very high percentage of ESL students. On the school website it doesn’t explicitly say that every student has access to a computer, in fact the school website says there are only 400 computer “workstations” at the school, but they do mention a 1:1 initiative. They also mention that 4th and 5th graders will be required to bring Apple laptops to school each day (in addition to the middle school and high school students who already bring laptops). They are transitioning to all Mac computers in the school and want students to have them too. Sounds great to me! There is a “retirement allowance” of 10 to 12.5%. I wonder if this means that each month this amount is credited to your monthly paycheck, or if you get that amount when you move on from the school. I would ask about this. Either way, it is free money! My friends who have been to Saigon (HCMC) have described it as the New York City of Vietnam. A huge, crazy city full of stuff to do at any minute of the day. The locals are said to be very friendly and welcoming to Americans. The cost of living is low and many teachers and visitors to Saigon say they like to eat out every night. You can find tons of stuff to keep you busy: museums, tunnels to explore, bike tours, temples, food tours, cooking classes, great architecture, movie theaters, malls, and of course, many traditional markets. This site lists 5 nights of salsa dancing per week! It doesn’t seem like Cuban Salsa is really popular here, but I did see a mention of a giant salsa rueda so maybe it is just a little hard to find. The school website lists the school as having, “107 professional teachers of 12 different nationalities.” This sounds like a great mix of teachers! Who doesn’t love Vietnamese food? Vietnamese coffees, spring rolls, and Phó noodle soups anyone? Also my friends said that you can find ANY international food that you are looking for too! 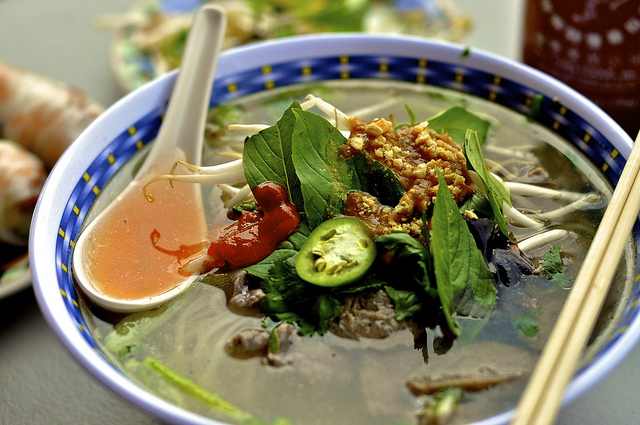 I fell in love with all kinds of Phó at home in Portland, and I can’t wait to try it in Vietnam! If you want to learn more about Vietnamese food and don’t mind getting a little drool on your keyboard check out Serious Eats’s post about the 20 Vietnamese Dishes You Should Know. Please comment! 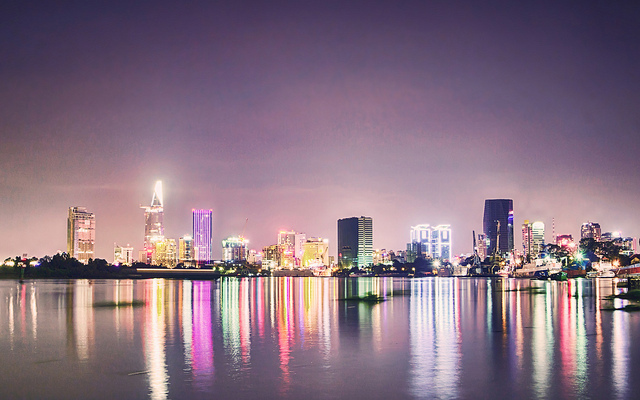 Have you been to Saigon (Ho Chi Minh City)? Would you want to work there? Have you or someone you know worked at the Saigon South International School? Can you add any info to what I’ve listed above? We LOVED Saigon. This is definitely an international city I would love to move to. The food like you mentioned is amazing. The city is fun and we felt extremely safe. And the prices there are awesome if you’re on a budget. The only cons are it can be extremely hot(but we kind of liked that) and the pollution is bad. How long were you in Saigon for? Good food, safe environments, and low prices sound like my kind of place. Also, considering that I’ve lived three years in a very hot and tropical country I think I would welcome the climate there. Also, having lived in Beijing it is hard for me to believe that Saigon wouldn’t be better. I hope I can at least visit there one day! Wait…are you in Columbia right now? Dreaming of Vietnam? Hm…it sounds like a great place to go next! It would seem like it, but I wrote enough posts so that I could leave my blog unattended for the week I was in Colombia. I’m focusing on exploring Latin America now, but I can definitely see myself relocating one day to SE Asia! Your Wishful Wednesday is my Joining in July…okay…alliteration didn’t work so well on that one. But that’s my school next year!! How awesome! Congrats on the job! I would love to interview you about your life as an international teacher in Vietnam after you’ve been there a few months and had a chance to settle in! Ha! Videos make me nervous and I’m not sure how it would work, but I just might consider it! I liked your videos about how to be an international teacher. So many people have asked me how I became an international teacher and how I got the job so I wrote about common interview questions, job fairs, contracts, and why I teach internationally. Videos help make it a bit more concise and reach a different audience. Good work!